Stand up paddle surfing (SUP), is a fairly new sport with a Hawaiian heritage. It is an old form of surfing, and has reemerged as a way for surfers to paddle longer distances. The sport is gaining in popularity even in calm coastal waters and lakes. The sport benefits athletes with a strong “core” workout. 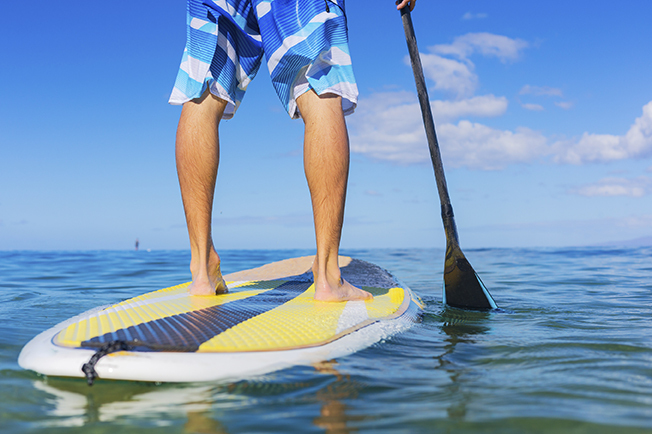 SUP’ing is popular at warm coastal climates . Another reason for its popularity is that, unlike surfing, paddle boarding is very easy to learn. Within one hour you will find yourself paddling around, confident and very comfortable in the water . Stand up paddle boarding is also popular among girls, specially because an average adult woman’s lower center of gravity can give them a balance advantage. Stand Up Paddling in Rio, is mainly practiced on the Canal de Marapendi, a clear water lagoon in Barra da Tijuca neighborhood. Some lessons take about 1 (one) hour including a short briefing. The lagoon has shallow waters, so people who do not feel very comfortable swimming, have nothing to fear.This activity is recommended to people at all ages, who have no history of knees or back problems. This activity requires that you maintain your body on a straight and rigid position, with the knees bent a little bit. People who already have experience may be able to book a surf lesson with a SUP board. It’s a very immersive tour option to every tourist in Rio, that offers the hospitality and warmth that carioca’s are known for, while also getting a very inspiring entertainment morning, with good laughs and sun filled exercises. There are several small companies that offer the service, and most Hotels have their numbers or websites for everyone to book their own lessons. Take a towel, swimming suits and extra clothes to wear after the lesson. Don`t forget to wear sunblock for sunny days. Small waterproof cameras are welcome. Esse registro foi postado em English,Entertainment. Adicione aos favoritos.